2) if you lost by the previous bet then double the stake, and set it again to minimum as soon as you win. Let's assume that a trader has $10000 trading capital and the minimal stake is $100 (less is not worthy due to fixed broker fees and our trader does not want to waste his time with penny stakes). At first we simulate only five scenarios in order to keep Figure 1 legible and get a "qualitative impression" of what may happen. You see that there are three scenarios with moderate profits and two scenarios with heavy losses. Figure 1 was created with the following R-code. Note that before doubling the stake after a loss we check (code lines 23-28) whether we have enough money for it. If not, we stop trading (and freeze the remained capital) and proceed to the next scenario. else #if lost, double the stake but check whether you have enough money! 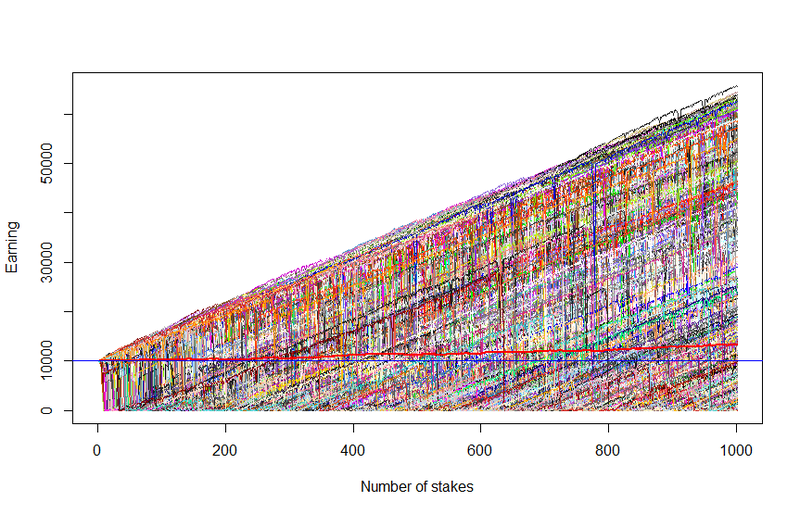 Since the outcomes are random, you get a different graph if you run this code. However, likely there will still be moderate profits and heavy losses (try to run the code several times). 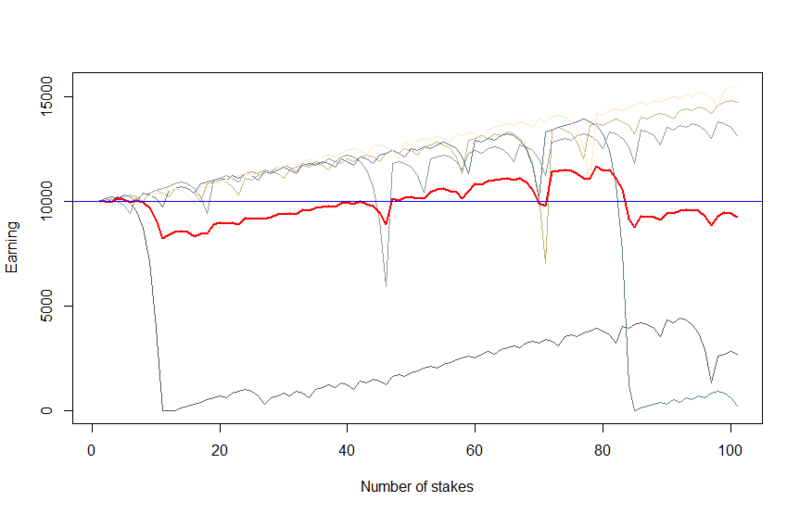 Now let us set N_SCENARIOS = 1000 in order to make our simulation statistically significant. 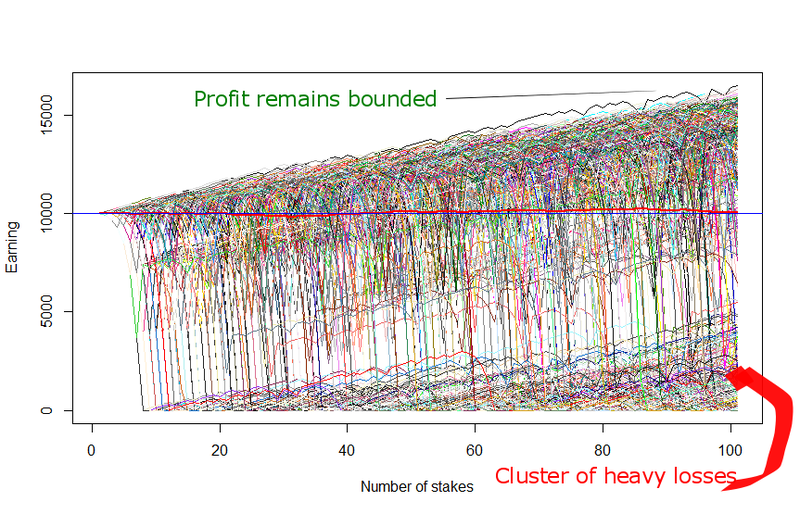 By N_SCENARIOS = 1000 approximately 2/3 of them end up with profit (since now we simulate a lot of scenarios, the ratio 2/3 will only slightly fluctuate if you re-run the R-code several times). But the profitable scenarios are bounded (even in the best case you hardly earn more than 60% on traded capital). And there is a distinct cluster of severe losses in the bottom corner! Finally, let us increase the number of trades setting N_TRADES = 1000 but reduce the number of scenarios setting N_SCENARIOS = 30 (otherwise we will hardly distinguish the lines on the graph). We see that though now there are some scenarios with really high profit, they are more occasional now (indeed there only 1/3 scenarios with profit). Esp. the dark-blue scenario justifies its colour, making us so blue: we had made more than 300% profit and then lost everything just after a couple of unlucky trades! In order to keep the integrity of our review we also provide Figure 4, which shows (red thick line) that the in expectation, i.e. on average among all scenarios, the profit does grow (in Figure 3 it decreases but it is accidentally and statistically insignificant since we have only a few scenarios). However, the growing expectation brings us little comfort since it grows exclusively due to extremely good scenarios that become extremely rare as the number of trades grows (recall: you can lose your capital just after a few of consequent unlucky bets). Finally, let's do some math to make everything clear. If you bet only once the probability to win is . If you bet twice, the probability to win at least once is since the possible outcomes are WW, WL, LW and LL. Generally, if you bet times, it is easier to consider at first the probability to always lose, it is equal to . Respectively, the probability to win at least once is equal to . Thus if you are going to make a series of five bets, you win at least once with probability . But if you already made four bets, the probability to win (or lose) by the 5th bet is ... because the bets are serially independent and the outcomes from the past are irrelevant for the future! Yes, it may sound counter-intuitive but if you doubt, do the homework: make at least 100 series of 5 coin tosses (so totally you have to toss a coin 500 times) and look whether the result of the 5th toss depends on the previous four...Of course the situation changes when the outcomes are serially dependent. For example, if you trade a commodity, sooner or later its price will rebound. For instance, it happened to the crude oil in the beginning of 2016: first it dropped below $30 but then jumped over $50 (however, don't expect this with a single stock, since companies do lose there market share and do go bankrupt). Another example: according to the law, the casino slot machines must give back a curtain percentage of money. If they are programmed suboptimally, they jsut spit out some cash after, say, a series of five losses. Slot machines massively appeared in Russia in early 90's and I know a guy, who watched gambles and then played if they left the slot machine after a long series of losses. The paradox with growing expectation is as follows: you make bets, each time doubling your stake until you win (and then you restart the process). If your capital is infinite can be arbitrary large, anyway, your profit in the end is (independent of ). 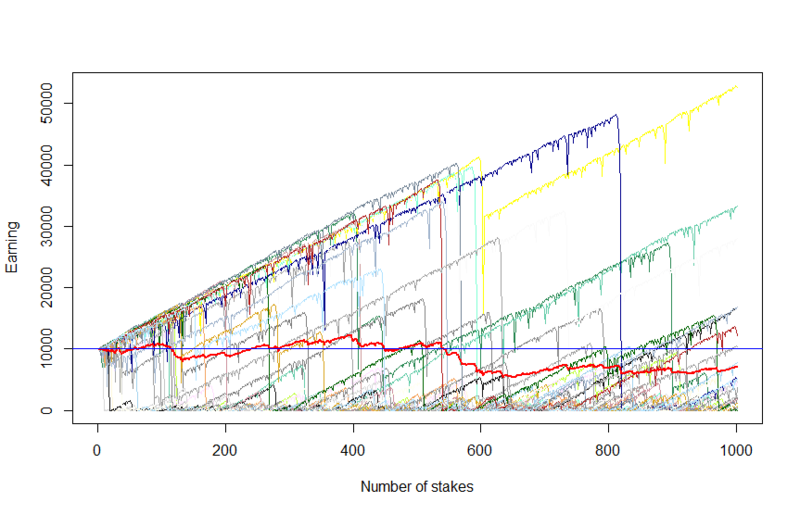 And the expected number of bets before you win is just But can indeed largely deviate from the expectation and your limited wealth diminishes with each bet as follows: thus you will most likely go bankrupt very quickly, recall the blue scenario at Figure 3! Nice example, off course this will happen because the model does not have a way to deal with risk. It would be nice, if next time you adjust your code and use a percentage of total wealth that you will reinvest, instead of a fixed betting size. The period of trading that you use is also to short, I would consider using a simulation of 10 million trades to make it statistically significant. And as you said, they will also have many uncorrelated bets running at the same time so that such big losses do not occur. 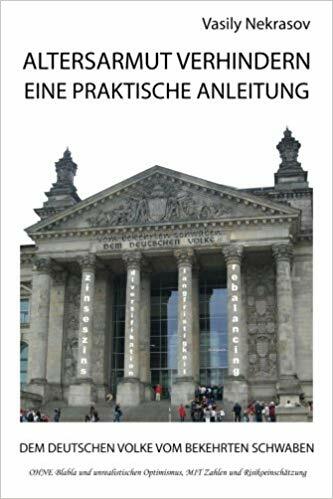 But even Kelly brings nothing if the odds are against you (like in Roulette or binary options, for which the martingale betting is often recommended). As to “simulation of 10 million trades”, can a trader commit 10 million trades in real life?! Nice paper indeed. Sophisticated market makers could easily reach this amount of trades. I believe it depends mostly on the frequency and the amount of instruments being traded.